Rich Dad Secrets to Money CDs – Robert Kiyosaki – Discount! Most of us grew up with the same set of rules: go to school, get good grades, get a safe secure job, work hard, build up your 401K, etc. We’ve all been taught that this is the way to reach the American Dream. But, the rich follow a different set of rules for making and keeping money. In fact, the rich live in a world most of us know nothing about. They pay less in taxes and set their lives up in such a way that money constantly comes into their pockets. At the same time, they use expenses to their advantage. In other words, it’s the rules of the rich that make them rich. 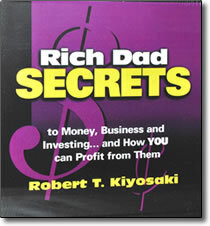 Rich Dad Secrets to Money, Business, and Investing offers the sessions about money that Robert Kiyosaki, a self-made millionaire, learned from his rich dad … a dad that gave him not money, but only his secrets to acquiring great wealth. In this groundbreaking program, you’ll learn these priceless secrets. Instead of working for money, you’ll learn how to make money work hard for you. You’ll discover why you don’t need a high income to become rich—and that all you do need is the type of financial education this program offers. If you’re looking for bold new ideas about money and are ready to make financial changes in your life, this program is just what you’re looking for.